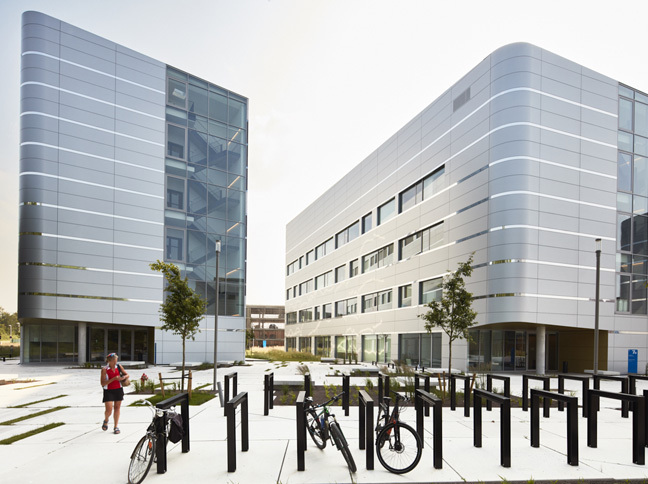 Commissioned by the developer Biovest, founded by the Mariën family, SVR-ARCHITECTS designed a brand new campus for biotech companies: Bioscape. executed in silver-coloured aluminium and glass, four individual lab buildings with four to six above-ground storeys were placed asymmetrically, as if set down by nature. Wadis between the buildings provide ecological water management. Traversable and transparent, the site is surrounded by a flower meadow, tall grasses and young trees. With a reference to American university campuses, Bioscape is an authentic Life Science Park, with around 16,200 m² of lab space, where almost 500 employees develop their talents daily. finished lab. Given all these qualities, the campus filled up rapidly. Companies such as Argenx, Eurofins, Intrexon Actobiotics and MyCartis quickly found their way to this new biotope, just a stone’s throw from Ghent University. It is worth mentioning that SVR-ARCHITECTS not only designed this project, but also developed the complete master plan, submitted the permits and carried out the programming and layout for the various laboratories. Bioscape is the first privately-funded bioincubator campus in Belgium.